Dubai, UAE; January 6, 2010: At the Top, the world’s highest outdoor observation deck located in Burj Khalifa, has opened to an overwhelming public response. Hundreds of people, mostly families, queued up for tickets to Level 124 of Burj Khalifa – and the chance of being among the first to experience its stunning views across the city. At the Top opened to the public following the dramatic inauguration of Burj Khalifa on January 4. An estimated crowd of 400,000 gasped in amazement as fireworks erupted and searchlights beamed from every platform of the tower. 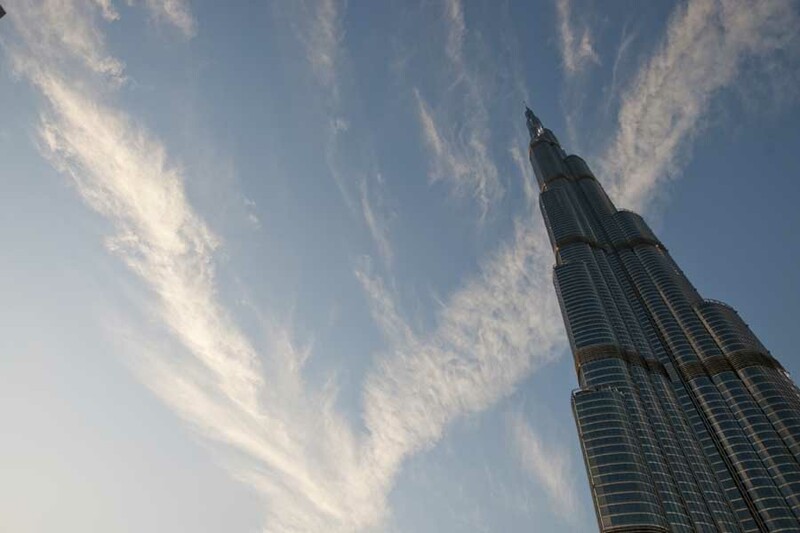 Mr. Thomas Dempsey, General Manager, Burj Khalifa, said At the Top would more than live up to people’s expectations. Tickets for the tour are time stamped at 30-minute intervals, on specific days, in order to carefully manage the daily rush of sightseers. The introductory time-stamped ticket price is AED 100 for adults, AED 75 for children up to 12 years and free for children under 3 years. For those who simply cannot wait, immediate entry is AED 400 per person, subject to availability. The entrance to the At the Top experience is at The Dubai Mall’s Lower Ground level. 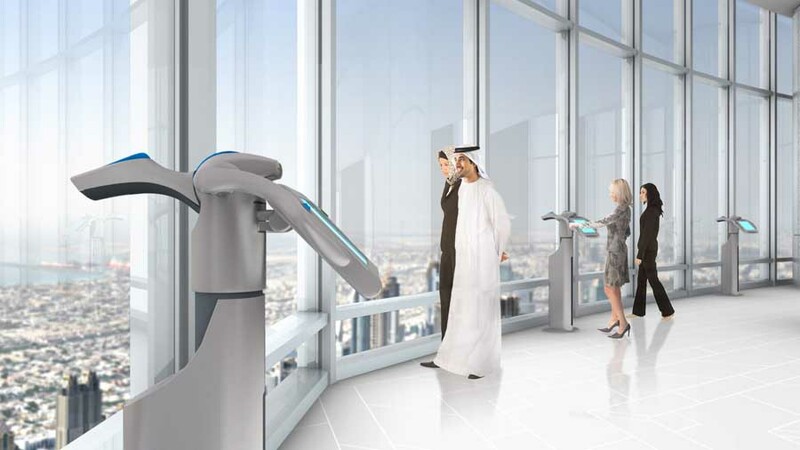 The reception area of the attraction features a large illuminated model of Burj Khalifa that introduces and familiarizes visitors with the various sections within the super-tall building. 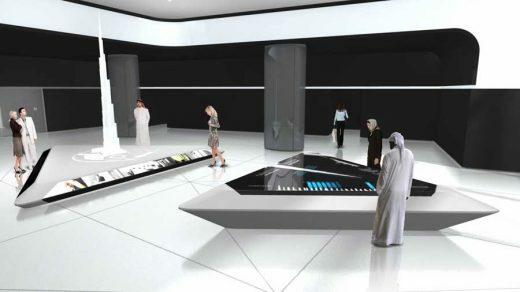 Multimedia displays ‘Dubai Then and Now’, ‘From Earth to the Sky’ and ‘From Vision to Reality’ narrate the evolution of Dubai and Burj Khalifa. The ascent to the 124th floor is by a double-deck elevator, each deck carrying up to 14 people and travelling at an amazing 10 metres per second. In less than a minute, the elevator reaches the observation deck, the world’s only public observatory at this height with an outdoor terrace. High windows circle the entire viewing platform, and, for AED 10, visitors can scan the horizon and the distant streets below through computerised viewfinders, which also have pre-programmed day and nighttime vistas of the city and surrounding region. Visitors can also buy official merchandise from the At the Top retail boutique. Dubai, January 4, 2010: The world’s tallest building was unveiled tonight to an estimated crowd of over 400,000 and the world, in a crescendo of fireworks, lasers and fountain displays. 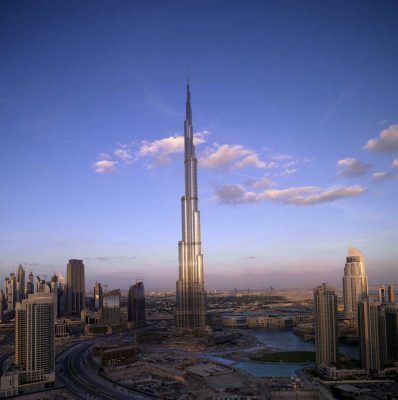 The official height of the tower, unveiled as ‘Burj Khalifa’, was announced as 828 metres (2,716.5 ft). 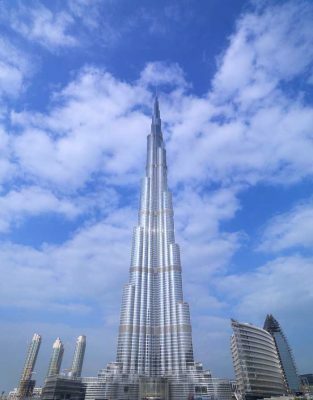 ‘Burj Khalifa’, developed by Emaar Properties (www.emaar.com), is the world’s tallest building according to the three criteria of the Council on Tall Buildings and Urban Habitat: ‘Height to Architectural Top’, ‘Height To Highest Occupied Floor’, and ‘Height To Tip’. The tower is 320 metres taller than Taiwan’s Taipei 101, which had held the title of world’s tallest building since 2004, the year when the project was announced. 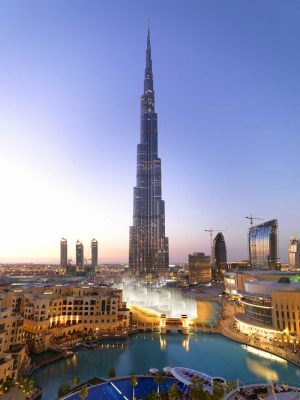 Mohamed Alabbar, Chairman of Emaar Properties, said that the tower represented a symbol of hope to the Arab world and a shining example of human achievement. A dramatic sound, light, firework and fountain display described the evolution of the tower, and ended in a breathtaking climax of lasers and fireworks, bathing the tower and the surrounding area in white light. ‘Burj Khalifa’ comprises luxury residences and offices, the world’s first Armani Hotel, and the world’s highest observation deck, ‘At the Top’, which is located on the tower’s 124th floor. Around 90 per cent of the tower’s offices and apartments have been sold. ‘At the Top’ opens officially to the public on January 5. The handover of offices and apartments starts in February, and the Armani Hotel Dubai will be opened by its designer, Giorgio Armani, on March 18. More than 60 leading consultants including South Korea’s Samsung Corporation and New York-based Turner Construction International realised the design for Burj Khalifa by Chicago-based Skidmore, Owings and Merrill (SOM).